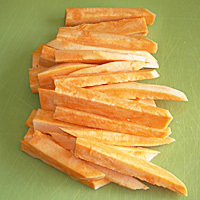 This veggie is an A-lister on the super food list, which is great because it's so sweet that it might as well be candy. I like to have my candy with nutrients, don't you? Check out the fiber content on this vegetable: that's more than your oatmeal can boast, and it holds all that fiber without any added fat. It's a complex carb as well, so even though it tastes sugary, it isn't going to spike your blood sugar. Pretty super, right? 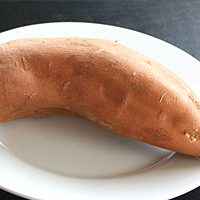 A basic presentation is simply roasting your sweet potato in the oven on 400 degrees for about an hour, just like you would a regular Idaho spud served up with a juicy steak. 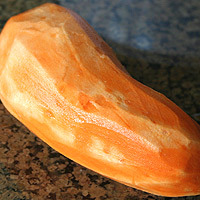 A little butter, salt, and brown sugar are all the dressing you need if the sweet potato is fresh. 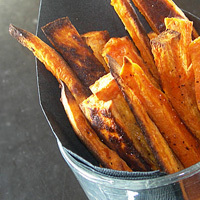 There are also a lot of recipes going around right now for sweet potato fries. Cut into strips, toss with olive oil, salt, and pepper, and roast in the oven on 425 degrees for about 30 minutes for your own homemade fries. They turn out great every time. We have a couple of new recipes at the bottom of the page to add to your sweet potato repertoire as well, but however you cook them, don't forget to pat yourself on the back. We're talking super food here. You can't go wrong. Selecting- The smaller potatoes are usually sweeter, so avoid the huge ones. Storage- Store in a cool dark place for at least 3 weeks, or even longer if it is cold enough. A fruit room in the basement works well or the garage. Keep them in a brown bag for best results. If the skin is still firm, the potatoes are fine to eat. such as French fries or cubes. Roast on 425 degrees for about 30 minutes. The skin will blacken in places, and that's okay. It adds flavor. Serve with ketchup or, I don't know... frosting comes to mind.